From conducting research to predicting impact, here’s how we decided to experiment with a referral program. NOTE: Sudbuds has since been retired, due to a change in pricing structure and target audience. It was good while it lasted, but came to a dignified end in September 2018. This May we launched Sudbuds, a referral program for our webcam and screen recording tool, Soapbox. One month later, and we have over 300 participants and a steady stream of referrals rolling in. And while it’s still too early to measure success, we’re feeling pretty good about our initial results so far! 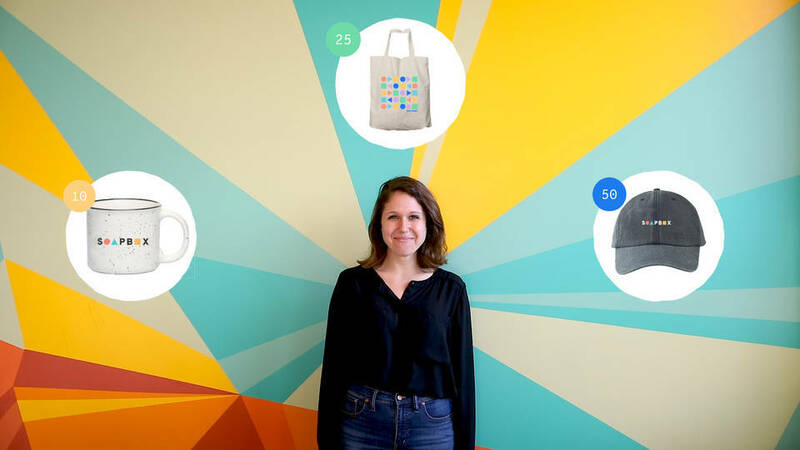 After all, we’ve never had a referral program before here at Wistia. So in order for us to really feel confident in our decision to start one, we had to conduct careful research, thoroughly assess the opportunity, and then deliberately scope the project from end to end. In this post, we’re going to share the steps we took to determine whether or not starting a referral program was right for our business. After soaking up all this intel, you should be able to apply a similar framework to assess the opportunity for your own business! Let’s dig in. Before we could get started, we needed to answer some questions about the referral program landscape. What successful programs were already out there? How were they structured and what did success look like for them? What were companies that we admire or even our competitors doing? What was working and what hadn’t been tried yet? As it turns out, there are tons of companies out there doing interesting things with referral programs. But ultimately, we decided to research 10–12 of them. We put the following parameters in place to help us narrow down our selection. The companies had to be in our space (SaaS). We wanted to make sure we were being comprehensive, but also focused. What worked for one company may not work for another if their business models weren’t similar enough. The companies should vary in size, and represent both B2B and B2C industries. As we mentioned before, you want your research in this phase to be comprehensive, so don’t just look at companies that are exactly like yours. Just because Wistia sells primarily to businesses and Airbnb sells to consumers, for example, doesn’t mean we can’t learn from each other. The companies should share our values. There are some very successful companies out there that don’t do business in the way we aspire to. What determines those companies' success and the nature of their partnerships will likely be very different from what informs ours. A quick Google search for “best referral programs” was a great place to start for us. We found that blog posts written by actual referral program platforms, like ReferralCandy, Influitive and RewardStream, tended to be very informative, since they knew a lot about their best customers that were growing the most. Some of our favorite examples of great referral programs were from Dropbox, Airbnb, and TheSkimm. Once we had our list narrowed down, we then dug into each referral program and looked at their sign-up pages, terms and conditions, rewards, and ultimately, signed up for the programs when we could. Dropbox was able to grow their business by 3900% with a simple referral program — check out their story. Determining the nature of a program’s success took a little more resourcefulness than relying on good-old Google. First, we took a look at articles that had been written about each company’s growth story. If the referral program was mentioned, we could then infer that it had been significantly impactful on their growth. Then, if the company was pretty transparent, we might even be able to find hard numbers around impact, like how many customers they had before launch and how many came in through referrals, for instance. After doing all of this preliminary research, the real question we had was whether or not our company would actually find success with a referral program. The fact that businesses like us had done well was an indicator of potential, but it didn’t mean that we would be successful by default. So, we took a step back and looked at Soapbox from top to bottom. Based on the business model, where our growth had come from in the past year, what the current priorities were, and what our resources looked like, we had to figure out if a referral program made sense. Here’s a deeper dive into how we actually assessed the fit. First, we wanted to get a clear idea of our customer affinity, both for our brand and our product. For true referral program success, we needed both customer loyalty and affinity. Sure, the perks had to be good, but the real reason anyone refers something to a friend or coworker is because they like the product and find it valuable. Here at Wistia, we’re lucky that we often receive a ton of positive customer love and feedback. We see it daily in our thriving Slack community, we saw it for years at WistiaFest, and we hear it anecdotally through our Support and Success teams. And one more factor in our favor? We’ve been known to design a pretty mean t-shirt or two. So, if we decided to go with physical rewards in a referral program (spoiler alert: we did! ), we knew we could pull off some pretty great stuff that people would actually want. The next step was to see what our customer acquisition funnel looked like for Soapbox. How did people hear about Soapbox? What was our pricing model? How were people signing up for our product? How did they expect to be able to buy our product? We’d seen both of our products grow organically through word-of-mouth referrals in the past, even without a program in place. Heck, Soapbox grew to over 70,000 users in its first year alone with very little marketing or direct sales for the product. At this point, we even had customers writing into our Support team asking if we had a referral program because of how often they told their colleagues about our products. Wistia and Soapbox also both run on freemium models, which means you can sign up right on our website and get started for free without even having talking to talk to anyone. We knew that this would also significantly lower the barrier for someone to refer a friend. After considering all of the above, going down the referral program route seemed like a pretty logical next step. Before we could really jump into the nitty-gritty details, we had to determine if we actually had the bandwidth to create and run a referral program. How did the company goals stack up to our progress so far? Was there an eagerness for new growth ideas or a readiness to experiment? What were the other projects on the table that might take priority? What was our resource capacity? 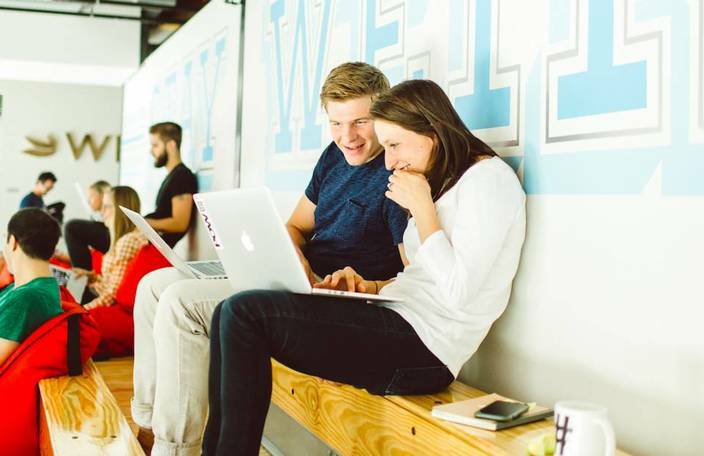 The team focused on Wistia’s core product had plenty on their to-do list already. The team focused on Soapbox, however, was newer, more agile, and ready to experiment. That didn’t mean we had resources to spare, though. On the contrary, a small team with a new product has to be extra careful about prioritizing the right work and understanding the potential impact of various ideas. That’s where the next step comes into play (a super important one at that!) — understanding your program’s potential impact. Would a referral program impact the current growth of Soapbox in a meaningful way? We had to find out! To begin answering that question, we needed to decide which Soapbox goals we were trying to impact. Adoption seemed natural — participants would be spreading the word to their networks and getting people to sign up. But we didn’t just want to get a bunch of new accounts for the sake of it. So, engagement became the next obvious choice. We decided that we would structure the program to only reward people if their referrals actually made their first Soapbox video. Next, we established a clear objective: to incentivize and reward our users for spreading the word about Soapbox in order to increase adoption and engagement. If adoption and engagement were our ultimate goals, we needed to look at the current state of affairs for Soapbox in order to assess the desired impact of a referral program. By marking what the current rates were, we knew where our goals needed to lie in order to help Soapbox grow. Down the line, we’d be able to measure the impact of the program against that starting point (keeping in mind that other things would influence the growth of those numbers, of course). But we couldn’t just set goals for the program based on what we’d like for the impact to be. That’s when we sought out some benchmark data for other referral programs. Now it was time to set our goals. We created a referral funnel with relevant conversion points, and then did some projections. Participation rate was based on our typical email click-through rate, since we rely on email as the main channel of communication with customers. 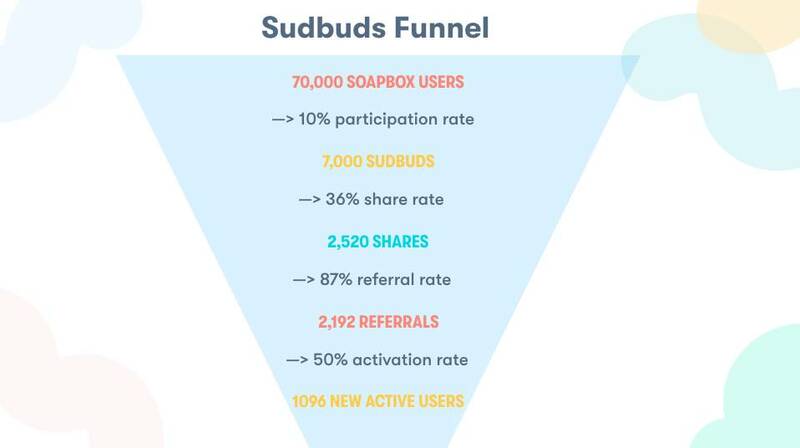 If a percentage of our customers would open the email and click on a link to join, we could estimate the number of new Sudbuds. Share rate was taken from the Amplifinity benchmark data about the percentage of participants that actively share their referral code or link. Referral rate was also based on the benchmark data about the average number of referrals per participant. Activation rate — the percentage of people that sign up and then actually make a video with Soapbox — was based on current Soapbox numbers. With both sets of numbers in hand, we could more easily determine whether a referral program could impact the growth of Soapbox in a meaningful way. 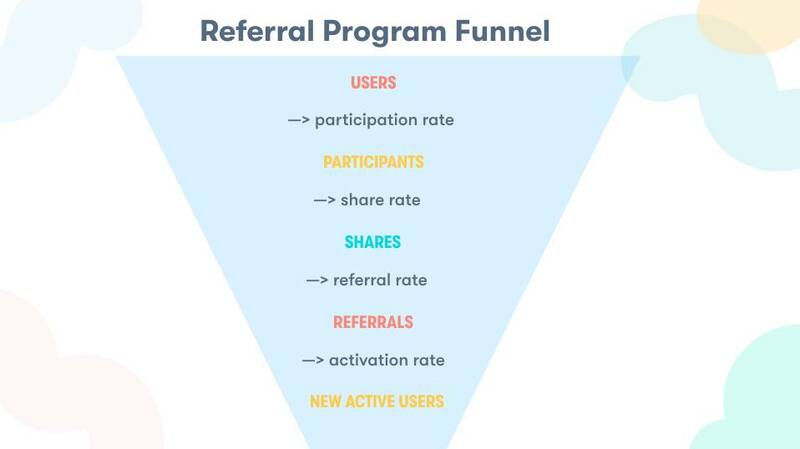 Keep in mind that a referral program is built to incentivize and reward participants for continuing to refer people over time, so any funnel numbers should be treated as the starting point for the first year. Last but certainly not least, how much time, effort, and money would it take for us to actually build a referral program? First, we calculated what the expected revenue was for new Soapbox sign-ups so that we could understand what it would mean for our program to be ROI-positive — after all, we want to make money, not lose it! For us, being ROI-positive was important, though this may not always be true for other companies. Next? Time and effort. We scoped out the work and time it would take to build this program for product, design, marketing, creative, etc. We thought through all of the steps it would take to design and build the program, to launch it to the world, track its success — you name it. We then met with team leads to get a sense of what the time and resource commitment would be. And finally, we assessed the risks involved in starting a referral program. We surfaced any unanswered questions, assumptions, and potential pitfalls we could find based on what we knew about our customers, the Soapbox product, and the internal workings of Wistia as a company. Ultimately, after conducting research, assessing fit, projecting impact, scoping the work, and estimating our return, we decided to create an MVP, or minimum viable product (in this case, an MVP of the referral program) for Soapbox. This meant we would build the lightest, fastest version first, measure its performance, and then decide how much more to invest in it at a later date. It’s safe to say we’re really pleased with how our program has gone so far, and hope you feel more inspired than ever to start evaluating one for your own business!